It has been a long time coming but I am ready to declare that Otus is well and properly sorted. I’m not going to bore you by rehashing all the events of the past – just understand that I have been on a 620 day journey that came to a happy conclusion Sunday, December 10, 2017. As simple as it sounds I threw my leg over Otus, pushed the start button, and he eagerly responded to the request. I rode him to Blip Roasters where I had coffee with friends. When I was as alert as I dared be on a Sunday morning, I threw my leg over Otus again, pushed the start button, and once again he eagerly responded. The ride home was uneventful and, therefore, blissful. When I returned home I tucked Otus back in the garage, connected the Battery Tender, and declared Otus well and properly sorted. After the ride I was chatting with a friend about Otus’ well and properly sorted status. Over the course of a few weekends we made several “repairs” to Otus in an attempt to get to root cause for the horrible way he was running. The problem I encountered was that Otus would run great until I had ridden him about 10 miles or so (just far enough away that I was too far to push him home). My first thought was that I had a fuel delivery problem. Based on this initial theory I decided that a good flush of the fuel system is what Otus needed. Remove the Auxiliary Fuel Tanks: A few years ago I decided I wanted to increase my range between fuel stops. Back in the day Luftmeister made “saddle” tanks that could be installed where the battery covers are typically installed. I pursued a pair of these tanks, installed them, and increased Otus’ range. Because fuel delivery on an Airhead happens because of gravity, and the saddle tanks didn’t always empty, I decided to eliminate them from the equation. They were removed, drained, and placed on the shelf. Drain and Muck Out the Fuel Tank: I then removed the fuel tank and removed the petcocks. The screens on both petcocks were pretty mucked up so I flushed them with fresh fuel, re-installed the fuel system, and tried again. Otus started right up and off we went with a Lawrence, KS as our destination. Unfortunately I once again made it far enough to be stranded. I allowed Otus (and me) to cool down and limped him home. When I got home I checked “fuel delivery” off the list of possible causes. Another “fix” I made was related to the kill switch on the right handlebar multi-switch. The switch itself was broken due to the sins of the past so I tried to repair it. Because I had eliminated fuel delivery as a problem (and air delivery was fine too because the air box and air filter were clean) I decided to source a new multi-switch to eliminate another problem. The parts ordering saga is documented here. I ordered a new left-hand switch as well but before opening it I discovered that it didn’t match the switch already installed. Otus has a neat feature – a switch to disable the headlight. This feature was eliminated somewhere along the way and I’m unwilling to remove this unique feature. I spoke to my friends at Bob’s BMW and they tell me that the switch with the headlight switch is no longer available so I decided to keep the one I received as a spare. Now, back to the story. Check the Electronic Ignition: Some years ago I retired Otus’ breaker point ignition in favor of a Dyna III electronic ignition. The electronic ignition is a “black box” and should it fail it cannot be repaired – only replaced. As a sanity check we confirmed that all the wiring was in place, unmolested, and we dressed it all down neatly. Another request for Otus to start was declined. There was great sadness and frustration. Replace the Right Hand Multi-Switch: The work was in removing the old and replacing the new switch. The left hand switch was, apparently, installed at the factory after the right hand switch so first we had to disconnect the left hand switch to disconnect the right hand switch. The right hand switch was replaced, the left hand wiring was re-connected, Otus was buttoned back up, and we once again asked him to start. Unfortunately this latest request was also denied. In fact, there was no power to the headlight bucket. Now it appears I had violated the Hippocratic oath and had done more harm that good. At this point I was convinced that I had done irreparable harm to Otus and the results were finally showing up. I was vacillating between delivering his last rites, being mad at myself, and hoping against hope that he could be saved. Rather than giving up straight away, we decided to go back through all the key systems on Otus. Check My Homework: Prior to the rough running I made a couple of what I consider “durability” upgrades. I replaced the stock diode board with an Omega diode board. The product description reads “Heavy duty high voltage automotive diodes in a large heat sink on a high temperature printed circuit board – what this means for you is consistent charging, long life, and a minimum of fuss.” All the things I like AND an oxford comma. This may be the perfect product! I also replaced the stock bonded diode board mounts with solid mounts. I reviewed the installation instructions, tracked down all my connections, and made certain I had properly installed the new diode board and the solid mounts. I also installed a new rotor for the charging system. As with the other “upgrades” I reviewed the installation. At the end of this homework check we found no errors but there was still no power to the headlight bucket. After re-checking this work we once again asked Otus to start but we were denied and there was still no power to the headlight bucket. After much scratching of the head we started talking about what might be preventing power from making its way to the headlight bucket. Was the ignition switch bad? Did I miss a connection in the headlight bucket when I put everything back together? Had Otus simply passed away? To try to figure this out we broke out a rudimentary circuit tester and started poking around. Check The Primary Relay: We found a problem. Using a multi-meter we determined that the relay wasn’t working. We removed the relay from the bike and started poking around with the circuit tester. We figured out how power should be getting to the headlight bucket and determined that the problem must be the main relay. We connected it to power and attempted to make it operate, but it simply wouldn’t click. After a few minutes of repeating the tests, we agreed that a new main relay was the most likely cure. 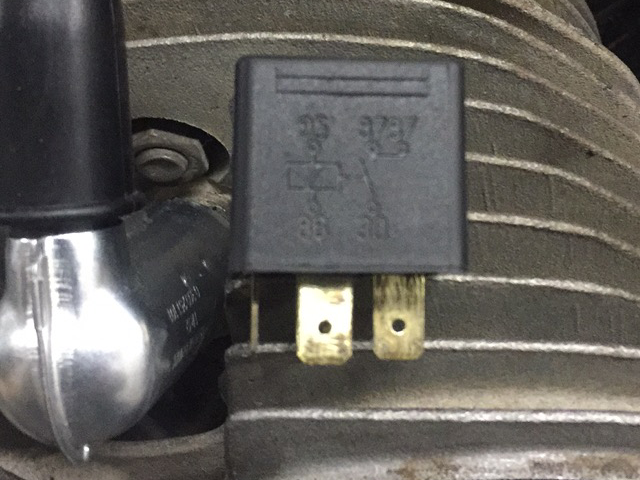 Rather than sourcing a new relay online I went to my favorite auto parts store, worked with the parts person to source a new relay, returned to the garage, and prepared to install it. 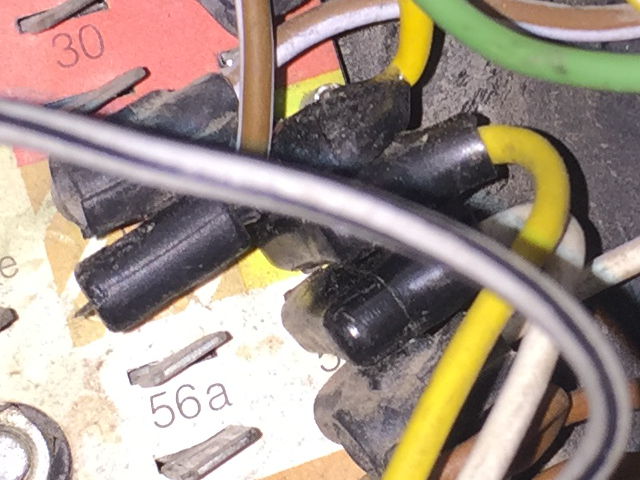 In comparing the old to the new I discover that the new relay was not correct. Dejected again, I was contemplating how to perform a motorcycle burial at sea in the middle of Kansas. While pondering that, we wondered if theold relay had really failed or if the contacts were just really dirty. We cleaned the contacts on the old relay, sprayed contact cleaner in Otus’ relay socket, and made another start request. Much to our delight (and my surprise and, ultimately, relief) Otus started! There was much rejoicing! Install New Spark Plug Wires: In going through my receipts and notebook I could not determine if I had ever replaced Otus’ spark plug wires. Since I had to order parts I added a fresh set of plug wires to the order as a precaution. In keeping with my general camping gear axiom (I brought it along so I’m going to use it!) we decided to go ahead and install the new plug wires and demote the current ones to backup status. After installing the new plug wires Otus again responded positively to our start request. At this point I was on the verge of tears of joy, but crying as my motorcycle was idling on the lift didn’t seem very manly so I contained my emotions, issued a high five, a fist bump, and then grunted in satisfaction. 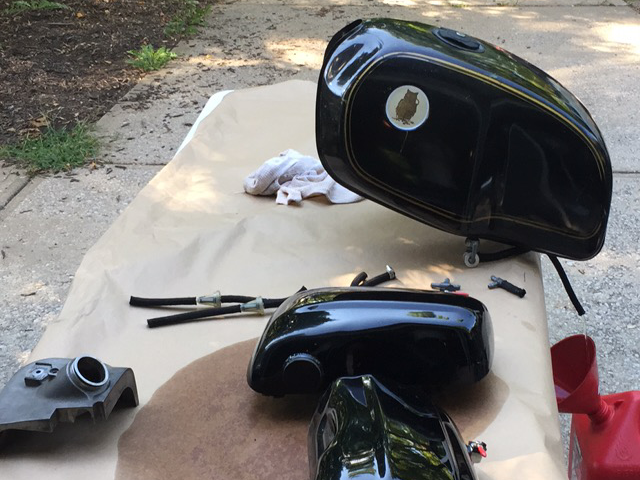 From that point forward it was a matter of buttoning up the headlight bucket and adjusting the carburetors. With these tasks properly performed Otus was declared well and properly sorted! Otus now stands at attention in the garage. He is in fantastic condition for a 40 year old motorcycle and is ready for our next adventure. The 2018 BMWMOA Rally will be in Iowa. We’ve been through Iowa before but this might be the right rally for his triumphant comeback!